The Marine Retailers Association is thrilled to release the results of its 2017 MRAA Compensation Study, the industry's first such report of its kind. We collected more than 2,600 position-level responses from 292 dealership locations and ultimately, generated some incredible data that we expect will give you great insight into compensation levels, benefits programs and more for the positions across your organization. Read the release about the Study Results. The findings cited in this report are based on a study initiated by the Marine Retailers Association of the Americas and made possible by the partnership and financial support of SeaDek Marine Products and the ABYC Foundation. It was created in response to an industry-driven desire to identify staffing and compensation trends for retail employees across North America. The results of the study are being shared with the industry through an Executive Summary, a Full Report and a Dynamic Online Compensation Calculator. The MRAA Compensation Study Executive Summary provides a high-level snapshot of the study's findings, and it was distributed, at no charge, to all businesses that provided usable responses for the Compensation Study. 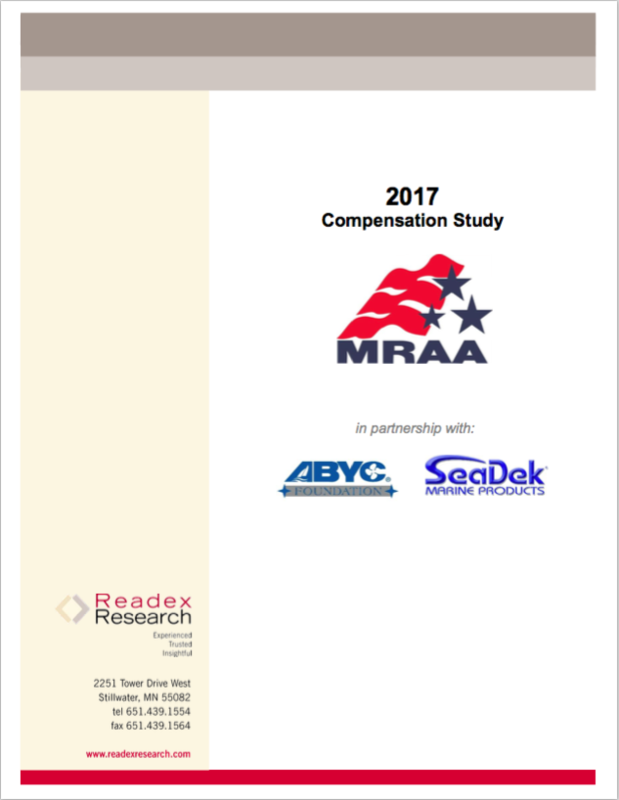 The MRAA Compensation Study Full Report is a 30-page document that outlines compensation trends for 35 job descriptions within typical marine retail outlets. It breaks down salaries and hourly rates at the 10th, 50th and 90th percentiles across the industry, in addition to providing insight into other compensation, pay increases, benefits programs, incumbents by gender and more. The MRAA Compensation Calculator provides compensation results filtered to your customized selections for each studied job position. Customized selection options include region, revenue size, number of locations and more. Results are then broken down into the 10th, 25th, 50th, 75th, and 90th percentiles and can be viewed in your browser and/or downloaded as Excel or PDF files. Purchase of this package provides you with an unlimited number of searches and reports on all 35 positions, allowing you to slice and dice the data based on your own preferences. Here is a downloadable attachment, a sample report from the calculator, which outlines pay structure on a national level, compared to a regional (Midwest) breakdown for the position of Parts Associate. This type of analysis is available for all 35 positions and can be broken down by your customized selections. The entire compensation study package can be purchased for just $299, and it includes the Executive Summary, the Full Report and full access to the Online Compensation Calculator, including unlimited searches and reports on unlimited job descriptions and comparisons. Those who contributed to the survey results can contact the MRAA for a promo code, offering $50 off of the entire package, and MRAA Retail and Partner Members receive a $50 discount if they are logged in upon purchase. Feel free to contact the MRAA offices with any questions you may have at 763-315-8043.